Enjoy the most beautiful and rich tour of Madrid with this 2 or 3 hour long journey from the Spanish Inquisition to the Golden Age of Spanish Literature, through the Literary Quarter and the Retiro Park - living remains of Madrid and Spain’s former Empire’s wealthiest centuries, while on top of a futuristic and eco-friendly bike. This tour will let you learn everything about those centuries in which Spain wasn’t only the Empire where the Sun never set, but a cradle of literary geniuses and internationally renowned painters. Beginning at Plaza Mayor, the center of life in ancient Madrid, former home to markets, bullfighting and the terrifying trials of the Spanish Inquisition, you will easily glide on our comfortable e-bike to the Literary Quarter or Barrio de las Letras, the neighbourhood where some of the greatest writers and poets lived, thrived and rivaled, such as Miguel de Cervantes and Lope de Vega. Riding down the famous Huertas Street, you will find yourself facing the Prado Museum, the wealthiest collection of Spanish art, one of the three museums along Madrid’s Art Walk with Reina Sofia Museum and Thyssen-Bornemisza Museum. Before entering Retiro Park you will have the chance to marvel at the beautiful Jerónimos Church, linked to the Spanish royalty since its construction in the 16th century. Once inside this ancient royal park, you will awe at its main attractions, such as the constantly photographed pond, the inspiring games light plays through the Crystal Palace or the famous statue of the Fallen Angel. 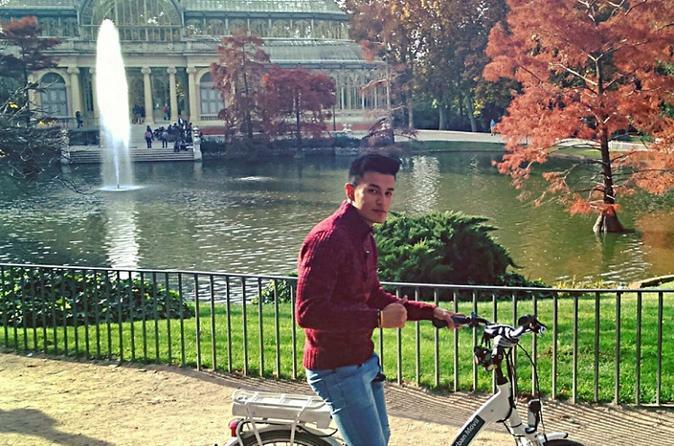 You will get to understand why locals spend their free time in this park where you can fully enjoy riding your e-bike before going back to the city centre along other iconic places in Madrid such as the the Alcalá Gate, Cibeles Square and Puerta del Sol.